The Wheeler Dealers formula is simple —Mike Brewer buys a car from some bloke, Edd fixes it up (with the help of few occasionally on camera lackeys), and finally they sell it to a new owner for a small profit — here is your opportunity to be that new owner. If you spend any time watching the automotive themed television these days, you might have seen a show called Wheeler Dealers on Velocity — where two chaps from Britain spend an hour (or two) saving some modern classic from the crusher and making a few quid while they are at it. The dollars per hour that Mike, Edd and their crew make per “flip” is a tuppence of reality show capital ‘D’ Drama (holds back of hand to forehead, rolls eyes upward, swoons slightly) because they aren’t in the business of car flipping, they are in the entertainment business — they could easily give away each car at the end of the episode and still pay the bills. 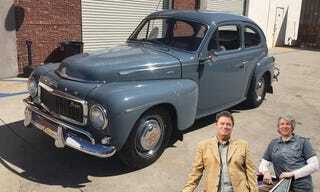 Find this 1962 Volvo PV544 Sport from Wheeler Dealers offered for $14,500 in Huntington Beach, CA via craigslist. To be perfectly honest, I’ve seen many of the episodes (and they aren’t paying me to say this), but I wouldn’t hesitate to buy a car from the wheeler dealers — particularly because they are in it for the entertainment value instead of the last dollar, but most of all they have a valued reputation for doing a reasonably decent restoration. Do they keep calm and carry on from time to time with a can of spray paint — sure, but they are honest about it and have done enough of these light restorations to do a good job. The car looks great in the pictures, but the seller “Gregg” (who is likely a show producer...which in Hollywood is code word for anybody who doesn’t have a guild job but still needs to get paid) states that the photos seen here are from progress and don’t depict the final product. However, with the recent Edd China restoration (new gaskets, seals, belts, hoses, brakes, bushings, shocks, steering, carpets, sound, rebuilt carbs, re-cored radiator, new exhaust,) this thing looks like a good deal if you ask me. Originally posted as Wheeler Dealer’d: 1962 Volvo PV544 Sport on Daily Turismo. Image credits; craigslist.